It is a two-stage Phase III non-Bayesian trial design proposed by Freidlin and Simon (2005) for settings where an assay or signature that identifies sensitive patients (i.e, biomarker-positive patients) is not known at the outset. This trial design permits the development and evaluation of a biomarker based on high dimensional data. It uses a training set to identify predictive biomarkers and evaluates them in a validation set. Generally, this approach is useful when there is no available biomarker at the start of the trial or there is a great number of candidate biomarkers which could be combined to identify a biomarker-defined subgroup, and the attention is given first to the entire study population. If the overall treatment effect is not significant at a reduced level a1 (< 0.05), the full set of P patients in the clinical trial is partitioned into a training set Tr (recruited before interim analysis) and a validation set V (recruited after interim analysis). A pre-specified algorithmic analysis plan is applied to the training set to generate a classifier Cl(x;Tr) where x is a biomarker vector. This classifier is a function that identifies a biomarker-positive subgroup of patients who appear to benefit from the experimental treatment E. Cl(x;Tr) = 1 means that a patient with x is predicted to benefit from E whereas Cl(x;Tr) = 0 indicates that a patient is not predicted to benefit from E.
The experimental treatment E is compared with the standard of care (or control) treatment in the biomarker-positive patients subgroup of the validation set using a significance level of a2 = α−a1 in order to ensure that the overall likelihood to obtain a false-positive conclusion is no greater than α (= 0.05). Note: Freidlin and Simon (2005) recommended that a level of a1 = 0.04 (two-sided) is allocated to the entire population hypothesis and a2 = 0.01 (two-sided) is allocated to the biomarker-positive subgroup hypothesis. The multiplicity problem is a concern with this approach as the statistical test is conducted twice; this is why the alpha is split so the total is 0.05. The power of this strategy can be increased using K-fold cross-validation as Freidlin and Simon (2005)  demonstrated (see the Cross-validated adaptive signature design (CVASD) for further information). Identification of optimal group of patients which benefit the most from a specific treatment. Identification and validation of candidate biomarker in a single trial. Avoids inflation of type I error rate as it does not use the individuals on which the predictive signature was developed in order to test the treatment effect. Rapid and efficient approval of the novel treatment as it combines two trials into one. No modifications in randomization weights or in eligibility criteria are made, consequently, it avoids any statistical adjustment needed to ensure that there is no introduction of bias. Larger sample size may be required, especially when there is small difference between biomarkernegative and biomarker-positive patients. Can limit its power when testing the treatment effectiveness in the biomarker-positive subgroup as half of patients are used for signature development and half for validation of the biomarker. Treatment comparisons can only performed when the study is completed. Freidlin B, Simon R. Adaptive signature design: an adaptive clinical trial design for generating and prospectively testing a gene expression signature for sensitive patients. Clinical cancer research: an official journal of the American Association for Cancer Research. 2005; 11(21):7872–8. doi:10.1158/1078-0432.CCR-05-0605. D ifference between the Adaptive Signature design and the Adaptive Threshold design : T he first one is used to develop and validate a biomarker, whereas this variant tries to identify and validate an optimal cut-off point for a pre-specified biomarker. In other words, the Adaptive Threshold design was suggested for settings in which a putative biomarker is measured on a continuous or graded scale with its threshold for detecting individuals who would benefit from the novel treatment not predefined at the initial stage of a Phase III trial. Difference in terms of the graphical display: In the main design, if there is no claim of treatment effectiveness in the entire population, then a portion of individuals is used to develop a predictive biomarker signature and the remaining portion is used to compare the treatment effect. However, in this variant if there is no claim of treatment effectiveness in the entire population, the design identifies and validates a cut-off point for a prospectively selected biomarker. Adaptations: Adaptations here are referred to the subgroup and there are no modifications regarding the required number of patients or randomization ratio. Note: In this design, human samples are collected to measure a pre-specified biomarker from the entire population at the beginning of the study but the value of biomarker is not used as an eligibility criteria. Methodology: Two analysis plans compose this approach, the so-called ‘analysis plan A’ and ‘analysis plan B’. The first plan is identical to the strategy proposed for the Adaptive Signature design. The second plan uses a more effective method to accommodate the multiplicity issue when combining the statistical tests for the entire population and the biomarker-defined subgroup by incorporating the correlation structure of the two test statistics. More precisely, the plans A and B are different in the way the test statistics and thus its distribution assuming true null hypothesis is calculated . Plan A: The test statistic is calculated as the maximum, across all possible cutoff values, of the log-likelihood ratio statistic for treatment effect for those with biomarker values above the cutoff value. Plan B: The test statistic is calculated as the larger of the test statistic for procedure A and the log-likelihood ratio statistic for treatment effect in the entire population. This plan is considered a generalization of the first plan because in case that a difference between experimental treatment and the standard of care is demonstrated, then the next stage is to find the biomarker threshold above which the targeted treatment is more beneficial for patients than the control treatment, consequently, among the cut-off points of a measured score of a biomarker, the maximum value is selected. This plan uses a larger sample size, resulting in appropriate power for establishing the statistical significance of treatment effect restricted to patients with biomarker values above an initially unknown cut-off point. Recommendations: Jiang et al. (2007) proposed the use of bootstrap re-sampling method for the estimation of the point estimate and a confidence interval for the cut-off point and described the sample size planning for this design. Also, according to Jiang et al. (2007) if plan B does not reject the null hypothesis, the estimation of the cut-off point value would be inexplicable, and thus it should not be estimated. Jiang et al. (2007) demonstrated through a simulation study that the second plan was more effective than the first one. A modification of the global test of the null hypothesis which was used by Jiang et al. (2007) is illustrated in the paper of Simon (2012). The Adaptive Threshold design can detect efficiently a global treatment effect and provides statistically valid tests when the promising treatment effect is limited to a particular biomarker-defined subset, however, a larger sample size may be required and can lead also to redundant power. Validation of a candidate biomarker without need for an established cut-off point. Requirement of a pre-specified biomarker for sensitivity, but not an established cut-off point. Identification of an optimal cut-off point for detecting sensitive patients (i.e., biomarker-positive patients). Data from the same study to both define and validate the cut-off point of the biomarker may raise concerns. Detection of overall treatment effect if one exists. Augmented costs due to the potential sample size increase and/or redundant power by partitioning the overall type I error. Statistically valid test if treatment benefit is restricted to a biomarker-defined subgroup. Reduces dependence on Phase II data for establishing a test cut-off point. More efficient design as compared to the traditional design (i.e., standard broad eligibility Phase III design based on assessing the global treatment effect in the overall population when the proportion of sensitive patients is low). Description: It is a Phase III design which collects tissue samples from the entire population at the start of the trial and analyse them when the study is near completion. After the collection of tissue samples from the entire population, all patients are randomized to either the experimental treatment or the standard treatment. 1. Comparison of the novel drug with the standard of care, but on a primary outcome measure which here is the overall survival using the significance level of 0.04. 2. In case that the results show the effectiveness of an experimental treatment over the control arm, we claim the effectiveness of treatment in the overall population. 3. Otherwise, an analysis is conducted for the identification and validation of the biomarker classifier (i.e., a combination of biomarkers) which gives the best primary outcome measure. A portion of subjects is used for the detection of a biomarker classifier and the remainder of patients for its validation. It is considered as a promising strategy without statistical considerations mentioned. Considered as a promising strategy for drug development as it takes advantage of the use of an end-point with clear clinical gain. Description: It is a Phase III design which collects tissue samples from the entire population at the start of the trial and analyse them when the study is near completion. After the collection of tissue samples from the entire population, all patients are randomized to either the experimental treatment or the standard treatment . Difference between Adaptive signature design and Cross-validated Adaptive Signature design : It is in terms of methodology. The former is composed of a split-sample approach, using approximately half of patients to develop the biomarker signature and the remainder of patients to validate it, whereas, the latter uses the K-fold cross validation procedure, i.e., there are K cross-validated training sets which are used to classify subjects in the corresponding K cross-validated validation sets. Methodology: After the classification of all patients, we compare the experimental treatment versus the control treatment in the biomarker-positive patients (i.e., subgroup of classifier positive patients). Gain more power as it could maximize the number of individuals taking part in the development of the biomarker signature. Can detect the subset of patients most likely to respond to a specific treatment in a more reliable way. Same challenges as the Adaptive signature design. Multiplicity problem for statistical testing as the statistical test would be conducted twice. Application: According to Simon (2010) , this approach is applicable when there are a number of available candidate biomarkers, but data from a Phase III setting is required for choosing the most appropriate biomarkers. 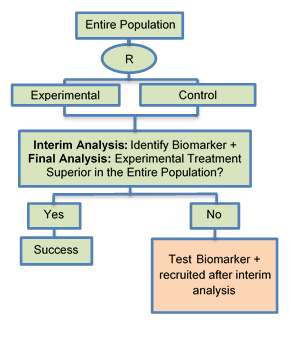 Methodology: Firstly, candidate biomarkers are selected and the cut-off points are optimized using a training set and secondly, the chosen biomarkers are assessed in the validation set. Optimizes the test based on randomized data for patients in the Phase III setting. Limits its power when testing the effectiveness of an experimental treatment in the biomarker-positive subgroup. Description: Adaptive Signature design with Subgroup Plots is an extension of Adaptive Signature design which has been proposed in order to add flexibility. Methodology: It uses tail-oriented or sliding window subgroup plots in order to identify a subset of patients which is most likely to respond to a particular experimental treatment after taking into account several cut-off points of the benefit score obtained by the subgroup plots.